We've seen it before. A small company cares about its customers until it becomes a big company. Then profits and stock shareholders matter more than satisfied customers or employees. Then the company becomes a monopoly and stops listening to its customers entirely. 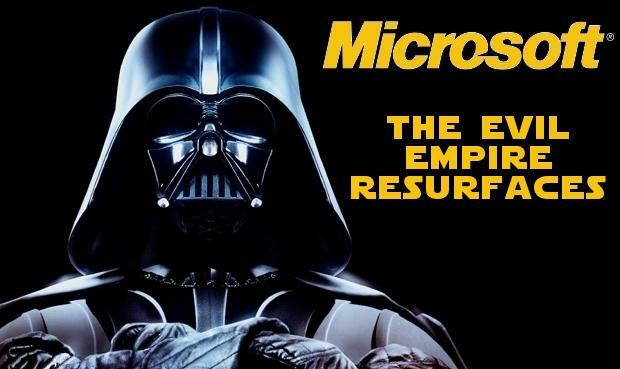 This is what happened to Microsoft, a company always ready to use the marketing department to ruin almost any product. Windows 7 was a very popular product but it did TOO much. You could buy and run all kinds of programs and Microsoft wouldn't make any money on them as it had no "Itunes Apple Store" type closed market. So they wrote Windows 8 which totally confused everyone, had not much online help and forced people into an MS marketplace where they were supposed to buy "apps" for and love it. Nobody did and the whole thing fell apart. A shiny bit of lipstick on Windows 7, Windows 8 sales were so bad that the company had to give away copies of Windows 10 in order to maintain it's market share. What about Windows 9? Ugh, see below. Not only did the company not listen to it's customers it told them what they were going to like. The architect of this stupid nonsense was executive Steve Ballmer. He is rich. So rich he makes Beverly Hills 1 percenters seem broke by comparison. In 2015 his net worth was about $22 BILLION dollars. Hired in 1980 as Microsoft's 30th employee he pretty much kept putting more zeros on his paycheck every year. Now he is the 21st most wealthy person on Earth. That kind of power, combined with being in the same work environment for years, makes it unlikely anybody is going to criticize you. Although known for his high energy product demos he apparently forgot everything about sales and marketing. His massive attempt to make Windows 8 work on everything was a huge flop and and he was eventually ousted from the company in 2013. Oh, sorry, he "retired." I would be forced out too if I had let the Apple Iphone become a huge hit, let my stock price stagnate, lost billions of my companies dollars in bad acquisitions and produced the poor selling Surface tablet. In 2012 Forbes magazine called him "The worst CEO of a large publicly traded American company." On news of his "retirement" Microsoft's stock price rebounded! 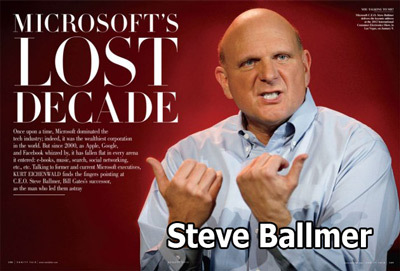 Ballmer was forced to slink away, fighting with MS founder Bill Gates and leaving bad blood at the company. With nothing going for him other than billions upon billions of dollars, Ballmer spent $2 billion to buy basketball team the L.A. Clippers. The previous own was hideous racist scumbag Donald Sterling who was forced to give up the team due to anti-Black and other comments. Ballmer brought fresh energy to the team and the players and coaches love him. He is doing a very good job and no doubt having a lot of fun in this new role. Have a Ball, Ballmer, just stay away from Windows! This is a funny parody of the way Microsoft designs packages. At first nobody knew who recorded the video. Then it was revealed to be Microsoft! They made a video criticizing themselves in order to motivate their employees to be more like Apple. Hmmm. 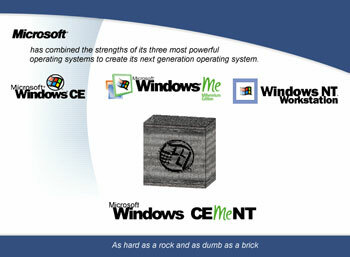 Nothing symbolizes Microsoft's tone-deaf approach to it's customers like the history of Windows names. Now this is the company's main product. It has earned them billions of dollars globally. You would think that somebody, ANYBODY, could come up with better names for this OS than the ones the company picked. The worst was called "Windows CE" or "WINCE". Doesn't that name just make you want to ... well ... wince!??? Here then are the stupid stages of Windows names. What could be simplier than naming your product version 1 - 2 - 3? Easy! For some reason Windows 4 was not chosen as a name. Instead Microsoft began gluing two letters to the end of the product for no particular reason. Let the confusion begin! Not only did Microsoft pick an out of the blue sky oddball name for this release but they also botched the product. An overly ambitious update, Vista had problems at launch which were finally fixed. But they gave the product a terrible reputation and sales were poor. Suddenly Microsoft got common sense and started naming their products after numbers again. This is probably because 7 is considered a lucky number in English. But don't expect too much sense making from Redmond. They totally skipped Windows 9 and went straight to Windows 10. What happened to 9? Was it caught molesting children? This doesn't even take into account that each version of Windows you just read about also comes in four or five flavors of it's own. This leads to extra-stupid naming conventions like Windows Vista Home Premium Pro Mobile. Erf! Lots of computer users barely know if they are using Mac or Windows, much less Windows 7 Professional Ultimate Home Mobile.